Environmental Economics: "Reporting back: the World Congress for Environmental and Resource Economists in Gothenburg, Sweden"
"Reporting back: the World Congress for Environmental and Resource Economists in Gothenburg, Sweden"
Another highlight with direct applications to BCA was the policy session, “Best Practices in Revealed Preference Approaches for Nonmarket Valuation Methods that Inform Environmental Policy,” organized by Catherine Kling (Iowa State/Cornell University). The session included talks on best practices for hedonic property value studies, hedonic wage studies, and recreational demand models. 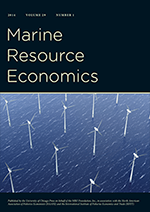 The three papers presented in this session were commissioned by the Review of Environmental Economics and Policy, and will be part of a future symposium on the topic in that journal. Don't read this if an increase in someone else's utility reduces your own (i.e., you are so jealous that people got to go to the World Congress and you didn't).